Cartoon submitted by Steve Kelley. 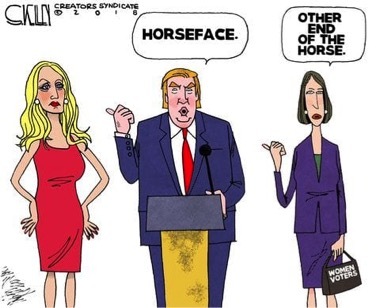 Where the newspaper guild and a “blitz” of readers have seen humorless misogyny and/or sexism in several recent Post-Gazette editorial cartoons, Steve Kelley, the cartoonist, tells us he smells the whiff of an organized campaign in that criticism. Kelley noted that many of the letters to the newspaper about the recent cartoons share certain words and phrases, almost always claiming the cartoons are misogynistic, unfunny and a half-century out of date. The Newspaper Guild of Pittsburgh used nearly identical language — calling the cartoons misogynistic — to criticize Kelley’s drawings in an open letter that it says the Post-Gazette refused to print. Kelley said he wonders how his newsroom colleagues could reach to use that word — “misogynistic” — about his work. Although it’s a word that many journalists are using quite frequently in the year-plus since the #MeToo movement began, its presence in response to his cartoons has surprised Kelley. “Pause and reflect for a moment precisely how unambiguously searing and offensive that word must be when directed at someone to whom it does not apply,” he wrote. In its 85-year history, the guild never had spoken out against the newspaper. But it broke with that tradition in January 2018 to say its members felt the Post-Gazette had written a racist column on Martin Luther King Jr. Day. Fuoco said it was absurd to think that the guild members would have time to organize a letter-writing campaign against Kelley over the cartoons. The union has been negotiating with the newspaper for two years over a new contract, and guild members have not received raises in 13 years, he said. Kelley also referenced my recent column about the controversy in which I had an exchange with Liza Donnelly, a cartoonist who draws for The New Yorker, Medium and CBS News. Donnelly defended Kelley’s First Amendment right to draw what he wants, but said she found the recent cartoons to be relying on outdated stereotypes, old-fashioned and unnecessarily negative toward women. Post-Gazette cartoonist Steve Kelley asks, “… would a man who hates women have drawn this cartoon about sexual harassment in the workplace early in his career?” Submitted by Steve Kelley. Saying she does not want to get into a back and forth, Donnelly told me that she respects Kelley’s right to draw as he wants but she disagreed with his analysis of her humor and what she tries to say with her cartoons. In his letter to me, Kelley also defended each of the three cartoons that have stirred controversy. In one, a woman on a dinner date says she’s a big fan of equal rights, until the dinner bill arrives. Kelley did some research to show two recent reports that support the idea that first dates remain fairly traditional, with men picking up the tab. “The notion that some women like that is hardly despicable,” Kelley wrote. In another cartoon, a young girl talks about one day divorcing a billionaire like Amazon founder Jeff Bezos. Kelley cited contemporary cartoons by women who talk about marrying a prince. “One can deny the notion that a girl wants to marry (or divorce) a man of means (or a prince, for that matter), but I think it is reasonable to suggest that some do,” he wrote. Finally, the third cartoon shows House Speaker Nancy Pelosi and suggests she couldn’t blink in negotiations with President Trump because of too much Botox. “And a joke about a prominent politician’s well-known use of Botox is hardly out of bounds for political humor — those jokes were common about John Kerry when he ran for the White House (I should know — I drew one of them, and no one accused me of misandry),” Kelley wrote. Women in power, like men, should expect to see themselves at the pointed end of cartoonists’ pens, he added. Kelley started drawing cartoons for the Post-Gazette in October, after an award-winning career at The San Diego Union-Tribune and the New Orleans Times-Picayune. 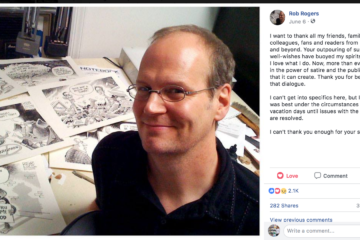 The newspaper hired him after it fired his predecessor, Rob Rogers, who had been with the Post-Gazette since 1993. 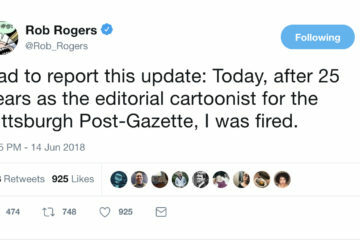 Rogers claimed the newspaper didn’t like his anti-Trump cartoons, while editorial director Keith Burris said the Post-Gazette had tried to find a middle ground. Kelley’s unedited letter to me runs in full here.